Up until SO recently, board and boxed games had fallen off my radar. Sensory activities, art, and other mom-made fun made my daughter’s days tick and as for me, I was also taking care of the most nonsleeping newborn y’ever did see, which pretty much meant I was nonsleeping, too. You know, just generally not a situation that was conducive to grabbing a box, blocking out some time, and just…playing. But now? THE FOG IS LIFTING. My daughter is finally at the magical age where she can open a box, understand a game, and play that game with a friend. WHA?! This is a, forgive the obvious ref but, a game-changer. And what’s more is that as Paris begins to entertain himself a little more on his own, I’m able to sit down and play a game, too. It really is the small things, right? Mattel was kind enough to send me a few games to try out: Squawk, which I posted about on Insta recently (it’s a game that features a squeezable squawking chicken that cracks my kids up), Uno (you love it), Apples to Apples (do you know this one? I’ll talk more about it in a sec), and Kerplunk. Kerplunk is kind of like pickup sticks in the way that the object is to carefully remove a stick without the whole thing fallin’ apart, except instead of a pile of sticks at risk of tumbling down, it’s marbles. The girls liked helping with set-up (poking the sticks through the holes), which is good because it does take a minute or two. My favourite thing about this game is that it’s easy to explain: “Take turns each getting a stick out, but be gentle because you don’t want the marbles to fall.” And then, they did it! One, then the other, on and on with grins on their faces, until marbles began to escape. Seeing them interact, share, encourage, and giggle together, well… my neighbor Jodi (mom to Petra’s friend here) and I were feeling proud of our big girls. The winner is determined by who got more sticks but of course, the girls each thought they had a million so they called it a tie. My friends Ben and Abi introduced me to Apples to Apples a few years ago and it’s the kind of game that EVERYONE likes because it’s easy to catch on to, makes for conversation, and you get to see how people’s minds work. Basically, there’s a card with a word on it dealt and everyone picks one of their word cards to best go with it. For example, if the dealt card is “hot”, you might have “thermodynamics” in your hand, you might have “funnel cakes”, OR the closest thing you’ve got could be “shake weights”. It’s funny. Extra funny when you’re playing with your grandma— good to note there’s a blurb on each card as to what the word or phrase could mean. 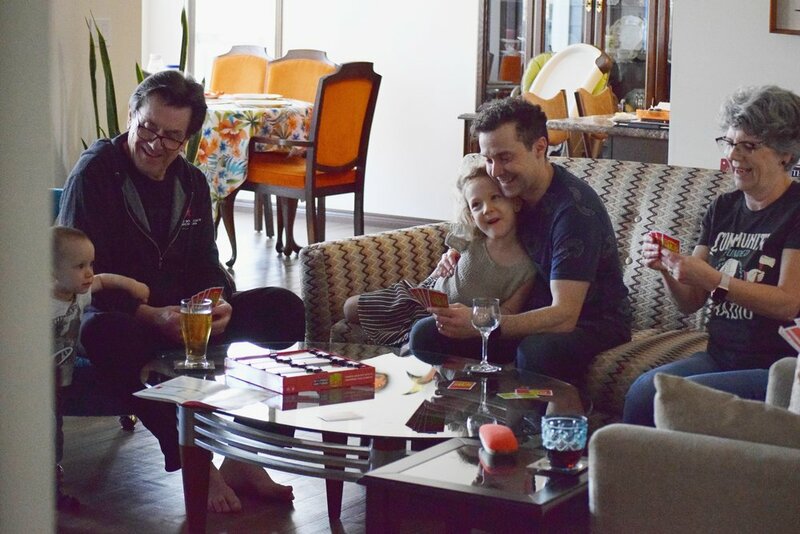 Apples to Apples is a great party game because people can sit wherever and you can deal someone new in since scoring is liberal (dealer’s fave gets to keep the dealt card and whoever has the most at the end wins). And although “thermodynamics” is pushing her phonetic reading abilities, Petra liked whispering to help various players decide which card to play. Thanks to Mattel for the fun! Love games, too? Stay close for a giveaway launching on the Sneakers & Lipstick Instagram: sneaksandlipstick, in case you’re not yet following!